Typically, a 36-31 Ohio State victory against a two-win team would force me to write a strongly-worded piece about the downfall of Buckeye football. Instead, Ohio State’s performance against Nebraska has made me more confident than ever that the Buckeyes can compete against the other playoff candidates. In this week's edition of Inside the Box, we will freak out about Ohio State's passing game for two minutes, praise the coaching staff's commitment to running the ball, mention the Buckeyes' red-zone success, and discuss the solution on defense. With the running game reviving to its preseason expectations, it is only natural that Dwayne Haskins had his worst game of the year. Haskins’ 252-yard, two touchdown performance was marred by a couple of turnovers. Haskins threw an interception in the end zone and fumbled the ball twice, losing one, giving him an even touchdown to turnover ratio for the first time in his career. The signal caller also put up his worst adjusted quarterback rating of the 2018 season (47.7). Most of the shortcomings through the air can be attributed to the mediocre play by Haskins and newfound success on the ground, but his receiver corps did not do much to help. K.J. Hill recorded just two receptions on seven targets, his worst catch rate of the season. He fumbled as many times as he caught the ball. Binjamin Victor had just one catch and Terry McLaurin failed to record a statistic. Haskins did not have a horrible game, just a less-than-stellar one; Buckeye fans have been spoiled by his greatness this year, making us forget what it is like to pass for a mere 200 yards a game. The passing game will likely fix itself and should be the least of Ohio State’s worries. After a season-long regression, Ohio State’s running game made its triumphant return. One of the best backfields in college football ran for 254 yards on 32 carries, good for 7.9 yards an attempt (YPA). Each of the backs had their fair share of highlight plays: Dobbins recorded a 42-yard touchdown while Weber bounced around twice, resulting in gains of 27 and 37 yards. All three drives ended in a Buckeye touchdown. Dobbins had his highest output of the season on Saturday, rushing for 163 yards on 23 carries. With three touchdowns, the sophomore running back arguably had the best game of his Ohio State career against Nebraska. Most impressively, 79% of his yards came after contact. Weber failed to record ten carries for the fifth time this season. He made the most of his attempts, however, hitting 91 yards for his best rushing mark since early September. Ohio State relied on early-down running for the vast majority of its rushing yards. 166 of the duo’s 254 rushing yards came on first down. This is a trend that must continue; the first down average of 8.3 YPA was higher than the backfield’s total average (7.9 YPA) and much higher than the team’s overall average (5.7 YPA). While the average distance of first down is obviously larger than that of third down, often resulting in fewer men in the box, it is clear that early-down rushing will favor the Buckeyes in the long run. Ohio State stayed committed to the ground game and as a result, balanced their offense for weeks to come. Breaking the trend of passing the ball 40+ times with minimal success on the ground was crucial for this team to be successful. It is no secret Ohio State has struggled in the red zone. In the last three games, the offense has scored points on just half of their possessions inside the 20-yard line. This horrendous mark puts the Buckeyes tied for No. 128 in the national rankings. This statistic is, unfortunately, not much worse than the team's season ranking of No. 113. On the bright side, the issue looks to have been addressed over the bye week. Two weeks after failing to score a touchdown in five red zone trips, the Bucks managed to score a touchdown inside the twenty in three of four attempts. The offense leaned on Dobbins in the red zone, giving the tailback 17 yards and two touchdowns. Parris Campbell helped pad Haskins' stats with a jet pass from the backfield, effectively giving Ohio State three rushing touchdowns in the red zone. Excluding Campbell's touchdown "catch", Haskins attempted two passes inside the twenty, one of which was picked off in the end zone. Did Ohio State Accidentally Solve its Safety Problem? With the ejection of Jordan Fuller and a practice injury to Isaia Pryor, Brendon White was able to make the most of his opportunity. White recorded 13 tackles, eight of which were solo and two came in the backfield. Despite seeing a little under three-quarters of action (58 snaps), White led the team in tackles on Saturday. To put White’s first-team debut in perspective, Isaiah Pryor and Jahsen Wint played a total of 87 and 82 snaps in the first two weeks of this season. 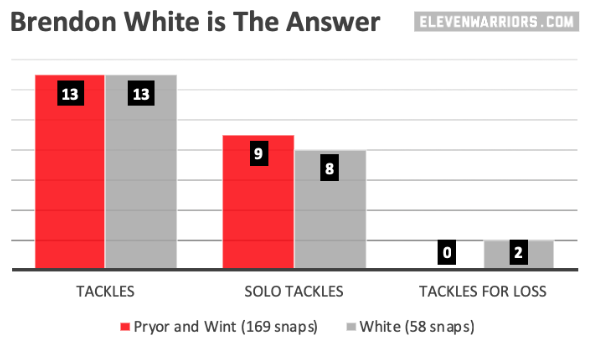 Pryor and Wint's performance in 169 snaps matched what White accomplished in 58 snaps. White was the diamond in the rough on Saturday; he outperformed two of his teammates in fewer snaps. As Kyle Jones points out, Jordan Fuller’s versatility may allow Ohio State to play Brendon White to the boundary. The result? A solution to one of the defense's biggest issues. Pryor and Wint have proved themselves incapable of playing at this time. White stepped up and had the safety performance Buckeye fans have been asking for all season. He deserves to start. But do I believe that will happen? Probably not. The coaching staff will likely stick to their guns and put Pryor back out there. Well, at least until he gives up another 40-yard run. Urban Meyer has stated that the decision will be made in the next few days. Coming into this week, Ohio State's issues centered around the stagnant ground game and a revolving door of a defense. With over 220 total rushing yards, some success in the red zone, and the emergence of Brendon White, things are starting to look up again for the Buckeyes before they head into East Lansing.